Measure up to 2 inches gauge variation while walking down the track. 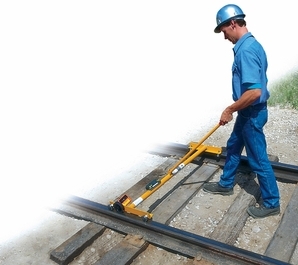 Spring-action telescopic assembly expands and contracts as gauge changes. Worker can read gauge while walking by looking down at a lens and gauge scale. Steel roller bearings measure gauge at 5/8" below top of rail. Passes over rail joints but cannot roll through rail crossings or switches. Clearance above rail: 1/8". • Shown with optional distance counter and digital level (ordered separately).